The UK’s largest water and waste water services provider, which supplies 15 million homes and business premises, is setting an example by reducing toilet and basin water usage in its own commercial buildings. Trials at Clearwater Court in Reading, where Thames Water has replaced some of its existing low flush toilets (which averaged 6.2 litres per flush) with Propelair models (1.5 litres), resulted in saving 80.7 per cent of the water used in the men’s and ladies’ loos. 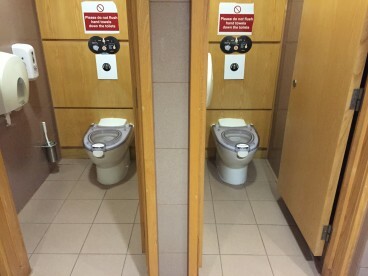 A combined water saving in just two washrooms monitoring five toilet cisterns, and fitting Cistermiser water sensors on taps and urinals, has resulted in an 83 per cent water saving – 606,000 litres a year and an average of 3,000 litres per person per annum. Andrew Tucker, water efficiency and affordability manager at Thames Water, said: “Water is a precious commodity and it is our duty to show by example how business premises, schools, offices and others can reduce their water consumption and bills. Thames Water has predicted that the planned refurbishment of all the Clearwater Court bathrooms using Propelair toilets as well as sensor taps and urinal sensors could save 4.8 million litres of water per year – a projected annual cost saving of around £9,950. Following the success of this pilot, Thames Water has also decided to install Propelair fittings at its Walnut Court offices and Spencer House site. Facilities management company EMCOR, which maintains all Thames Water sites, was very impressed at the water savings. Customers that have already come on board include the Oracle Shopping Centre and Majedski Stadium in Reading, where installations will be carried out next month.